Do you feel safe at work? I hope you do 100% of the time. If you don’t, this article focuses on violence happening against healthcare staff from their patients. Nationwide safety standards are being considered. Some states and healthcare systems have adopted their own policies and safety training. Would you like to share your experience with our DiversityNursing.com community? Do you have some helpful advice? Your input is appreciated. Thank you. Here’s an alarming statistic: Around one in four nurses has been physically attacked at work in the last year. Patients often kick, scratch, and grab them; in rare cases even kill them. In fact, there are nearly as many violent injuries in the healthcare industry as there are in all other industries combined. Healthcare workers make up 9 percent of the workforce. There are currently no federal rules mandating that hospitals attempt to protect nurses from violence in the workplace, though some states have passed them on their own. State-specific measures include requirements that hospitals develop violence-prevention programs, such as teaching de-escalation techniques, and increased penalties for people convicted of assaulting healthcare workers. In October, California passed the toughest guidelines in the country, obligating healthcare employers to develop tailored violence-prevention plans for each workplace with employees’ input. But the problem has gotten so bad that the U.S. Department of Labor is considering setting nationwide workplace-safety standards for hospitals in order to prevent this kind of abuse. Patients with dementia or Alzheimer’s and patients on drugs were the most likely to hurt nurses, according to one research study published last year in the Journal of Emergency Nursing. The study surveyed more than 700 registered nurses at a private hospital system in Virginia, and 76 percent said they had experienced physical or verbal abuse from patients and visitors in the previous 12 months. About 30 percent said they had been physically assaulted. Working directly with patients in emotional and physical pain has always put healthcare workers at risk of violence. But in the past decade or so, there has been a 110 percent spike in the rate of violent incidents reported against healthcare workers. The intensifying abuse has a lot to do with money: During the Great Recession, public and private hospitals began slashing budgets at the same time people were losing jobs—and their health insurance. That meant fewer nurses and security guards available to help when patients got out of control, and more people turning to hospitals instead of private practice for medical care since they couldn’t be turned away due to lack of insurance. States also cut billions of dollars in funding for preventative mental-health services, which likely had a significant effect on the frequency of violence against doctors and nurses. 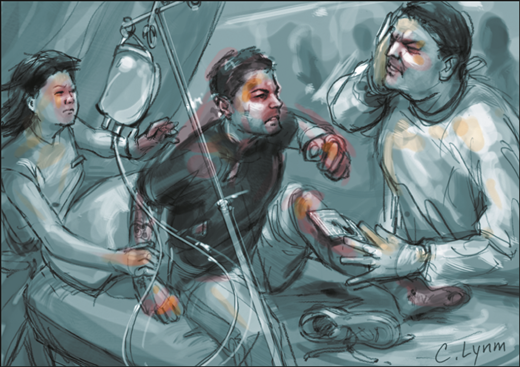 Psychiatric patients are increasingly seeking treatment in hospital emergency rooms, where staff are often unprepared to deal with violent outbursts. “This is creating volatile, unpredictable situations,” says Bonnie Castillo, a registered nurse and director of health and safety for National Nurses United, a labor group representing more than 160,000 nurses across the country. Her organization has been pushing states to pass laws to protect workers in the healthcare industry. "A delirious patient kicked her so hard in the pelvis that she slammed into a glass wall and fell to the ground. She was two months pregnant." There’s also a pervasive notion that dealing with unruly patients is just part of a nurse’s job. “We always feel discouraged from reporting it,” says Castillo. She said she was punished by a past employer for calling 9-1-1 after a patient attacked her. It’s not surprising then, that only 29 percent of the surveyed nurses who were physically attacked actually reported it to their supervisors. About 18 percent said they feared retaliation if they reported violence, and 20 percent said they didn’t report it because of the widespread perception that violence is a normal part of the job. A spokeswoman for the Inova Health System hospitals, where the nurses were surveyed, did not respond to a request to comment for this story, though it’s hardly a problem unique to one hospital. As the Department of Labor considers implementing nationwide safety standards, individual hospitals are also taking their own measures. One hospital in Massachusetts offers self-defense classes for staff. Another in the state hosted a training exercise that simulated potentially violent hospital scenarios: gang violence in the emergency room, an outburst involving a mental-health patient, and an estranged ex-boyfriend in the maternity unit. But these types of precautionary measures are not the norm at hospitals across the United States, leaving many nurses unprepared for violent encounters. The lack of state or federal personal-safety standards as danger in the workplace grows may contribute to the shortage of nurses in the United States. When there are not enough nurses at hospitals, and those who are there feel stressed and unsafe, patients and staff all wind up suffering. Have a question regarding workplace violence or maybe you have a general question? Click below to ask one of our Nurse Leaders!